The Climate Change Wildlife Action Plan Guidance Document provides voluntary guidance for state fish and wildlife agencies wanting to better incorporate the impacts of climate change on wildlife and their habitats into Wildlife Action Plans. The approaches and techniques described in this document will also be useful in modifying other wildlife plans (e.g. big game/upland game/migratory bird plans, joint venture implementation plans, national fish habitat action plan, etc.) to address climate change. The document provides an overview of the information currently available on climate change, tools that can be used to plan for and implement climate change adaptation, voluntary guidance and case studies. Climate change is a large and growing threat to all wildlife and natural systems and will also exacerbate many existing threats. Efforts to address climate change should not diminish the immediate need to deal with threats that may be independentof climate change such as habitat loss/fragmentation from development, introduction of invasive species, water pollution and wildlife diseases. Since climate change is a complex and often politically- charged issue, it is understood that the decision to revise Wildlife Action Plans or other plans to address climate change, rests solely with each state fish and wildlife agency. All states will be required to update their Wildlife Action Plans by 2015, although some states have opted for earlier revisions. Wildlife Action Plans may need to be revised earlier or more frequently than anticipated to account for the accelerating impacts of climate change. 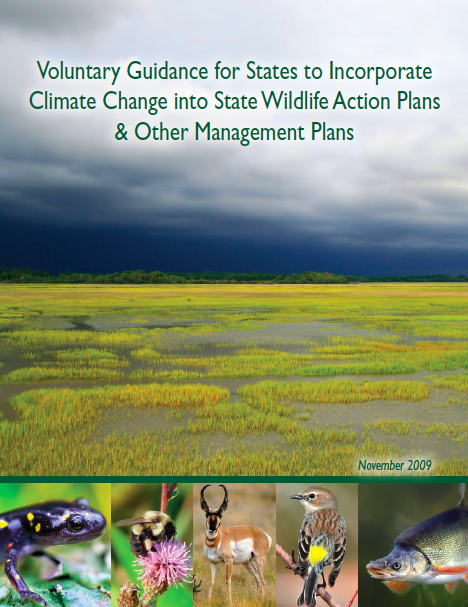 In addition climate change legislation passed in the U.S. House of Representatives in June 2009 would require each state to develop a state adaptation strategy and to incorporate that strategy into a revision of the state’s Wildlife Action Plan (similar legislation in the U.S. Senate is being considered). Although revision of Wildlife Action Plans for climate change is not currently required, starting the revision process now can help states prepare for potential climate change funding through federal appropriations in FY10 and/or through funding that may become available if Congress passes comprehensive climate change legislation. The Guidance Document consists of three major chapters that provide information and resources that could be used to update Wildlife Action Plans to incorporate climate change impacts. Chapter 1 introduces processes, approaches and key concepts that can be used to develop climate change adaptation strategies for fish and wildlife management. Chapter 2 describes tools, both old and new, that may be useful in developing, implementing and monitoring for these plans. Chapter 3 provides more detail on the process of updating Wildlife Action Plans, summarizes existing guidance and discusses how addressing climate change might affect the plan revision process. The references section and appendices to the document are a source of additional information on climate change.